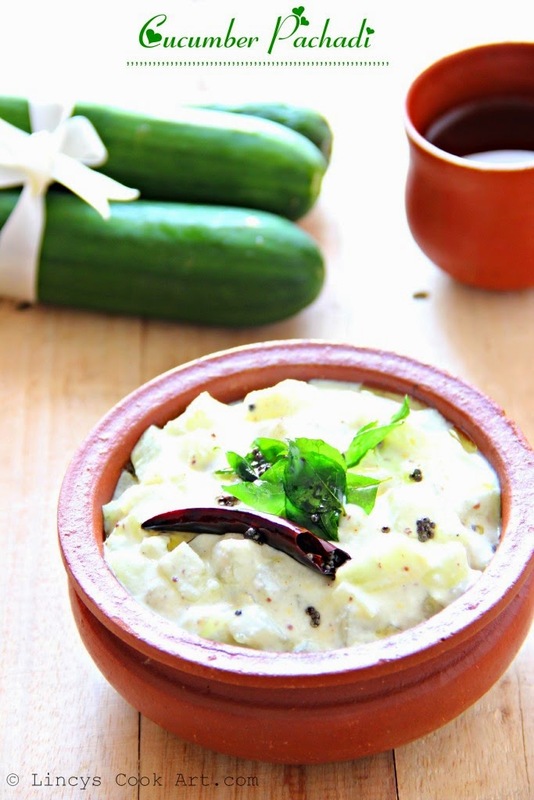 Kichadi/Pachadi is an Indian salad, made with yogurt and cucumber, usually served as an accompaniment to rice or indian breads. Pachadi and Kichadi is a side dish made from different vegetables like ginger, cucumber, pineapple, lady's finger, bitter gourd or ginger.etc. For Kerala Sadyas (Grand feast) Pachadi /Kichadi is prepared the day before. Peel the cucumber and cut and remove the inside seed portion using a knife and chop them. In a blender grind coconut with green chilli as fine paste. Add mustard seeds with the paste and pulse twice or thrice. In a pan add cucumber, salt and water to submerge the cucumber and cover it and cook till soft to touch. Drain if excess water is there in cucumber. Add the ground paste, salt and allow to cook for fifteen to thirty seconds. Do not cook long time the mustard seeds makes the pachadi bitter. Switch of the stove and add the beaten yogurt. In a pan add oil and add mustard seeds when it splutters add dry chilli and curry leaves. Add this tempering on top of cucmber kichadi.